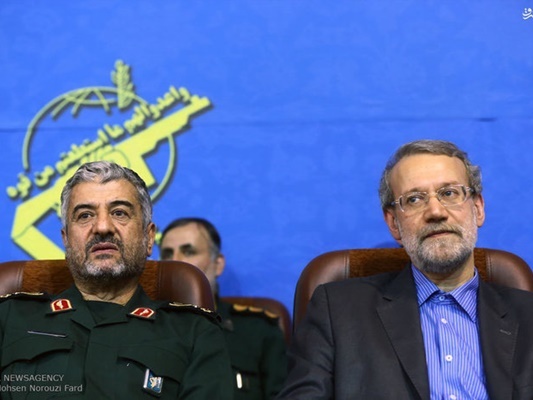 Iranian parliament speaker has praised the decisive role played by the Islamic Revolution Guards Corps (IRGC) after victory of Iran’s Revolution in 1979, saying the Corps should be appreciated for their numerous achievements. “We are required to express our gratitude towards the IRGC for its achievements,” Parliament Speaker Ali Larijani said, according to a Farsi report by ICANA. Speaking in a ceremony to commemorate the Iranian martyrs of the Parliament’s protection command and those who sacrificed their lives to defend the holy shrine of Hazrat Zeinab, the granddaughter of Prophet Muhammad (PBUH), in Damascus, Syria, Larijani said the IRGC was established on the very first day after the victory of the Islamic Revolution in 1979 to address the exigencies and respond to the difficult situation of the country at that time. The IRGC which is interconnected with Basij [voluntary] million-strong forces and has acted based on the responsibility placed on it by its school of thought and ideology, managed to notch up numerous successes during the Iran-Iraq war (1980-1988). He said the IRGC forces are among the best forces in fulfilling the aspirations of the Islamic Revolution and remaining faithful to them, adding, since the very beginning of the IRGC’s formation, they have put in a very impressive performance in providing officials with protection, which has minimised the perpetration of terrorist acts in the country. Larijani noted that in addition, when the country’s aviation sector was beset with a number of problems in providing protection, they, again, helped resolve them. In the initial days following the victory of the Islamic Revolution, Iraqi forces invaded Iran, he recalled, adding, at that time, everybody was willing and seeking to fight invaders. “However, those who has [and will] sacrifice their lives to defend Hazrat Zeinab’s holy shrine, are solely seeking to protect the Islamic school and ideology — a preoccupation and an inclination which is quite unique worldwide,” he added.